A building owned by Columbia University collapsed on West 130th Street in Harlem Thurs., March 22, 2012. MANHATTAN — A 69-year-old construction worker was killed and two others seriously injured when a violation-plagued building recently bought by Columbia University collapsed in Harlem Thursday morning during demolition work, authorities said. The tragic incident unfolded at the one-story structure at 604-606 W. 131st St., near Broadway, just before 8 a.m., killing Juan Ruiz, of The Bronx and leaving his wife of 46 years, Francesca, inconsolable. "Ay, Dios mio!" she cried, clutching a picture of her husband at their home. His son, Juan Ruiz, Jr., described his father, who was buried in an avalanche of rubble, as a hard-working immigrant from the Dominican Republic who worked for the same company for 14 years. 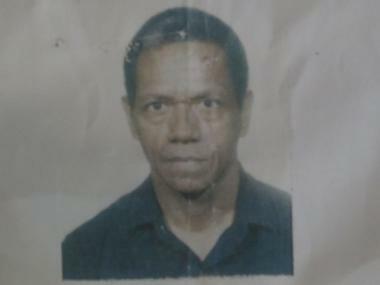 Juan Ruiz, 69, was killed in the building collapse in Harlem on March 22, 2012. "He was very family oriented guy," said his son, Juan Ruiz, Jr., 38, in Spanish through an interpreter. "He went from the job to the house." And in a tragic twist, Ruiz feared that the building, a warehouse that dates to 1915, was too old, making the job more dangerous than most, his son said. Ruiz, King Range, 60, and Sakim Kirby, 30, also from The Bronx — all had to be pulled from the wreckage by hand. They were rushed to St. Luke's Hospital where Ruiz died. Range suffered life-threatening injuries and Kirby was seriously hurt, fire officials said. According to FDNY and Department of Buildings officials, the workers were cutting a structural beam near the building's perimeter wall when steel, concrete and red brick began raining down on them. "I just seen brick falling on the workers. I just seen people running towards it but they couldn’t get them out," said witness Willy Katende, 46, who lives nearby. 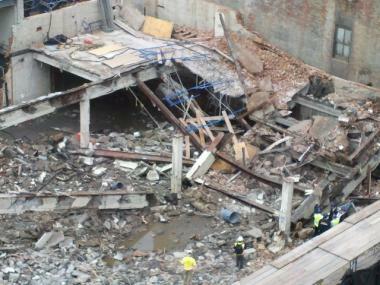 Two of the workers, including Ruiz, were partially buried by rubble near the center of the building. The third was buried near the building's northwest corner about 50 feet away, officials said. Emergency responders had to tunnel under the debris to reach the third worker, who was trapped for about 45 minutes and suffered head injuries. The incident left Range in intensive care at St. Luke's Hospital with a ruptured shoulder blade, his son, King Range, Jr., of The Bronx, told DNAinfo. "It's tough and tearful," he said. "You see this on the news all the time but you never imagine that it touches home." Range, Jr. said his father had been a construction worker as long as he could remember. "He's a strong man and I got that strength from him," Range, Jr. said. Kirby, meanwhile, suffered head and spinal injuries, said his father Curtis Kirby, 50, who was anxiously awaiting MRI results. "He's talking. He's holding my hands," Kirby said of his son. "He's in and out, but hopefully he's gonna be all right." The father, himself a construction worker who specializes in interior renovation, said he was "numb" after the accident. Kirby said he hopes Sakim, with whom he spoke daily, recovers so that the two can pick up the family pastime — fishing. "The season is just getting started," the dad said. "I don't want to miss that." The construction company, Breeze National Inc. of Brooklyn, was hit with two separate violations by the DOB earlier this month for failing to notify them about beginning demolition work and for workers failing to wear safety harnesses at the site. The company declined comment on Thursday. Work was allowed to proceed at the site then because the violations were pending, officials noted. 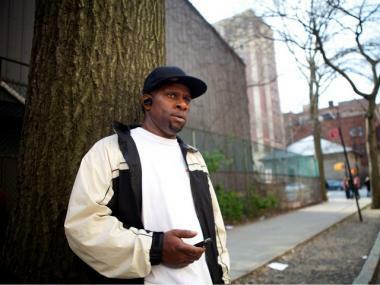 Curtis Kirby, 50, whose son, Sakim, 30, was injured in the building collapse in Harlem on March 22, 2012. The DOB ordered all work to stop Thursday at the property. "Inspectors & engineers probing cause," the DOB said on Twitter. The property, which records show was recently purchased by Columbia University, is part of the college's ambitious expansion in the area. "First and foremost, our hearts go out to the family, friends and co-workers of the construction worker who was killed in this tragic incident, and our thoughts remain with the two other workers who were injured this morning and their loved ones," a Columbia University spokesman said in an email. It's not the only Columbia-owned property in the area that's run afoul of DOB inspectors recently. DOB issued a partial stop work order on March 19 at the Columbia-owned 637 W. 125th Street, after inspectors found a damaged crane at the site. And a construction worker was killed two years ago at a project site across the street also owned by Columbia, after reportedly falling into an elevator shaft following a heart attack. Dozens of people hit the streets Thursday evening to protest Columbia's controversial expansion in Harlem. "It's very much in line with what we're protesting about," said Ruth Eisenberg, a teacher who earned her master's degree from the university, referring to the collapse. After the accident, Ruiz, Jr., said he was shaking when remembering his dad. "He was a very good person, a very good father," he said. "He will be remembered for that."